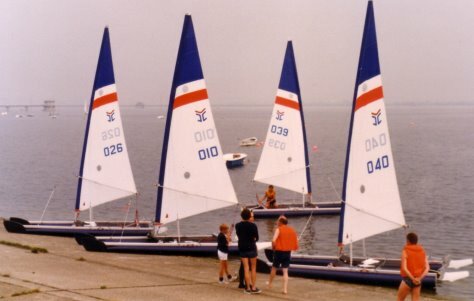 Catapult was launched at the Southampton Boat Show in 1982, and in 1983 some 87 boats were sold. The basic platform of the boat has not changed but the rig has gone through a long development period up to the year 2000, keeping it in the centre of catamaran sailing in the UK. 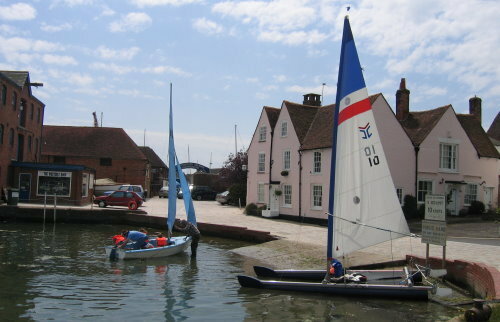 A light 7m two-piece mast with a round 6.9 cm section supports a 10sq m Dacron sail, triangular with no battens. To rig, the assembled mast is first pushed through the wide luff sleeve (lying on the ground) and the shrouds attached through a window in the sleeve, before the whole rig is lifted into place and the boom then fitted. There are no battens and no halyard. Sail fullness is adjusted by an articulated wish boom, with a tensioning line passing through the middle of the sail, providing powerful tension. Fully tensioned, the sail sets with a marked mast bend, making the whole rig very distinctive on the water. Sail flow is observed by two sets of telltales in Perspex windows. The only other controls are the downhaul and a fixed in-haul limiting foot stretch. The Classic sail cannot be lowered on the water, but the sail can be furled by wrapping it tightly around the mast after lowering the boom, and fastening tightly e.g. with an elastic strop. This can be very useful coming in, as at Calshot when the onshore breeze is up onto the steep beach, or when cruising inland waterways. For cruising, the rig is forgiving of any inattention, but the main advantage is that it tacks very quickly in tight waters. 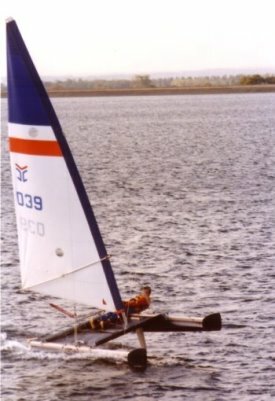 Below: The Classic rig at speed at Bewl in a Spring blow, the last time the rig won a TT race, showing the extravagant mast bend when the sail is tautened.